Writing these posts month after month I always say that I can't believe how fast time is passing us by and how quickly she is growing and I'll say it again, what's going on?! 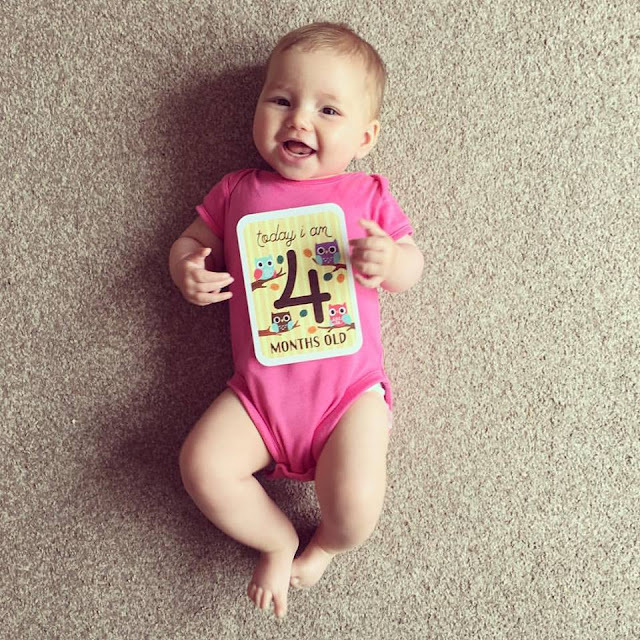 Ava is now 4 months old and she's really coming into her own little character now and it's so lovely to watch her grow and learn as the weeks and months pass us by. 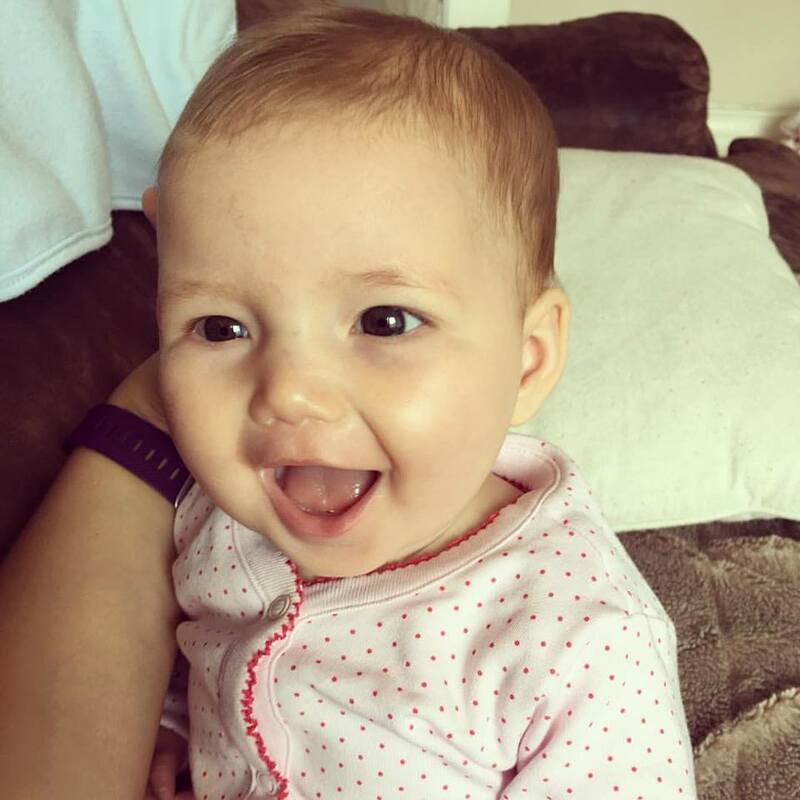 She is such a sweet natured little girl, she's so happy and is always smiling. She loves to be talked and sung to, kissed, cuddled and snuggled. She's already like my little best friend, she's such a sweetheart. She's starting to find her voice, has a whole array of different noises and is her happiest when she's in my arms. I haven't had her weighed for a while but I know she's gaining weight like a trooper, she's really thriving. She is wearing mainly 3-6 month clothes but some of it is small, other pieces have plenty of room so I think it depends on the fitting. I'm going to have to start buying 6-9 months in some clothing, already! I'm currently looking online at various websites for deals on sleep suits and the Jacamo promotion here looks great because I can keep her sizing up to date without spending more money that I need to. I can't believe how big she's getting, she's so long and has super chunky thighs and the sweetest little hamster cheeks. She's has a little cough and cold on and off lately, thanks to her brother bringing home all the germs from nursery. She's been fine in herself though and has just got on with it, although she's had a little bit of calpol here and there. She had her second lot of injections a few weeks ago and thankfully had to side effects from them. We are still breastfeeding and everything is going really well, I'm so happy about our journey so far. I feed her on demand and she probably feeds about 10 times in 24 hours but I couldn't really put a number on it really as I don't keep track. The past week I've started to express milk here and there with my Medela Swing so then my partner can feed her in the evening too. So far it's been helping when it comes to settle her but I'll mention more about that below. As mentioned above I recently started expressing my milk as I wanted to try something new at bedtime. Ava has only just started settling upstairs in the evening (before this she would only sleep when I went up to bed!) Now I take her up at 7pm, all dressed and ready for bed and I breastfeed her to sleep. I then sneak away and about 15 minutes later she will wake and my partner will take up a bottle of expressed milk and usually she will then go to sleep. This is the only way we can get her to settle without me there with her so for the moment we are going with it. She usually wakes twice in the night for a feed but I usually fall straight back to sleep with her. Naps are still hit and miss but we are making progress in that department too, I think! *She now laughs at funny things and not just when she's tickled. She's only recently started doing it so both Nick and I have to really try to make her laugh but Noah only has to jump up and down and she's in a fit of laughter. *She can now reach and grab for things perfectly, without missing. She's a dab hand at bringing things to her mouth and can even put her dummy in herself. *She's very vocal and has so many different noises and sounds that she can make. Her favourite at the moment is like a gurgling sound and one that sounds just like a telelphone ringing! 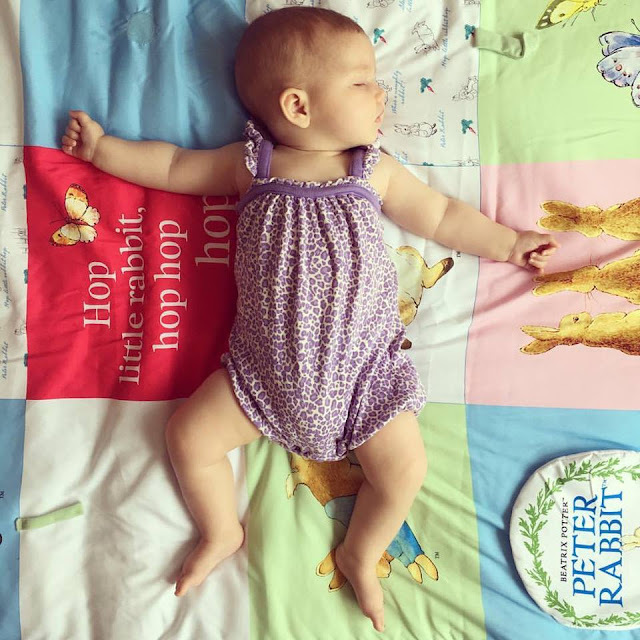 *She's not yet rolling over but when you put her on her belly for tummy time she's very strong and try's to push herself forward with her legs. It wouldn't surprise me if she learnt to crawl before she rolled but I hope she takes her time! * She had her first bottle at last week and has just the one in the evening and it's my expressed milk, not formula. Some breastfeeding babies can be fussy when taking a bottle but Ava accepted the MAM bottle right away, the first type of bottle we tried! 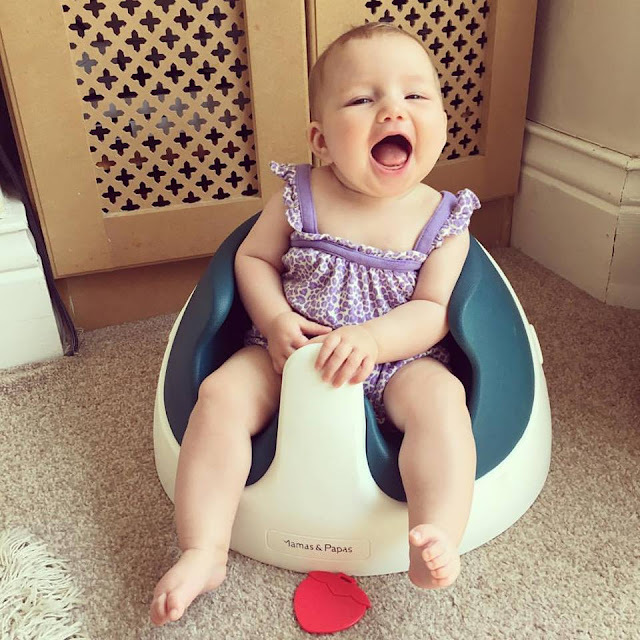 * We bought her a jumperoo and she's learning how to bounce in it pretty quickly. Ava loves to be held, cuddled and kissed. She's totally besotted with us all and thinks her brother is hilarious. She loves her bedtime feed when we snuggle up in bed together and I nurse her to sleep. 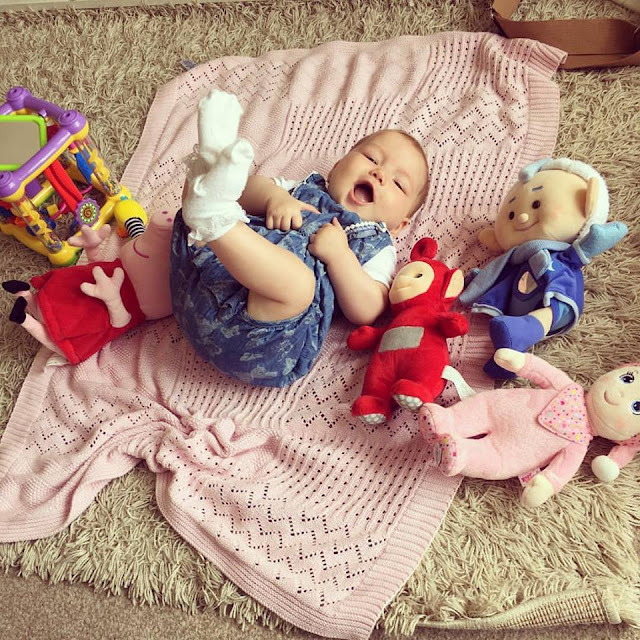 She also likes books, songs, singing, slinky, sophie la girafe, musical toys, her bunny, muslin cloths, baby TV, Peppa Pig, trees, bath time, Mummy's bed, Daddy's beard, watching us eat. She doesn't like having her clothes changed, she hates it. She also doesn't like being in her car seat or in the car. Ava does seem to be growing up fast. She looks more mature facially. Nice that she spends time with the various members of the family. Has Ava had a hair cut, as looks like she may have. Ava may link / associate you with food / nourishment. Hope your new routine works for you all. As we all need rest /sleep. Yet Breastfeeding is so beneficial for mum and baby. As you say Ava is still receiving Breastmilk. Also it may be beneficial that Ava will settle for Nick / others. As it means that her needs can be met :- Even if there are unforeseen circumstances that mean you are unavailable to Ava. Nick may feel that he can help, by allowing you to get some rest. As well as being a loving father to his daughter. A daughter who is content to be spending time with him, will settled to sleep, etc. It seems like last week I was looking at your blogs to see if she'd arrived yet! 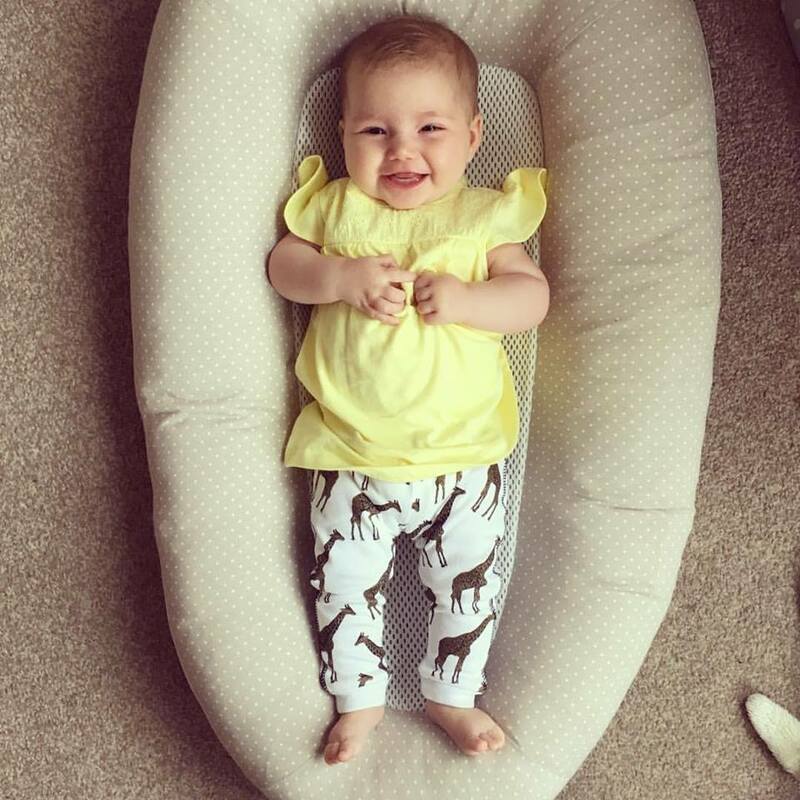 She's gorgeous, such a smiler! Nice to see Ava developing. 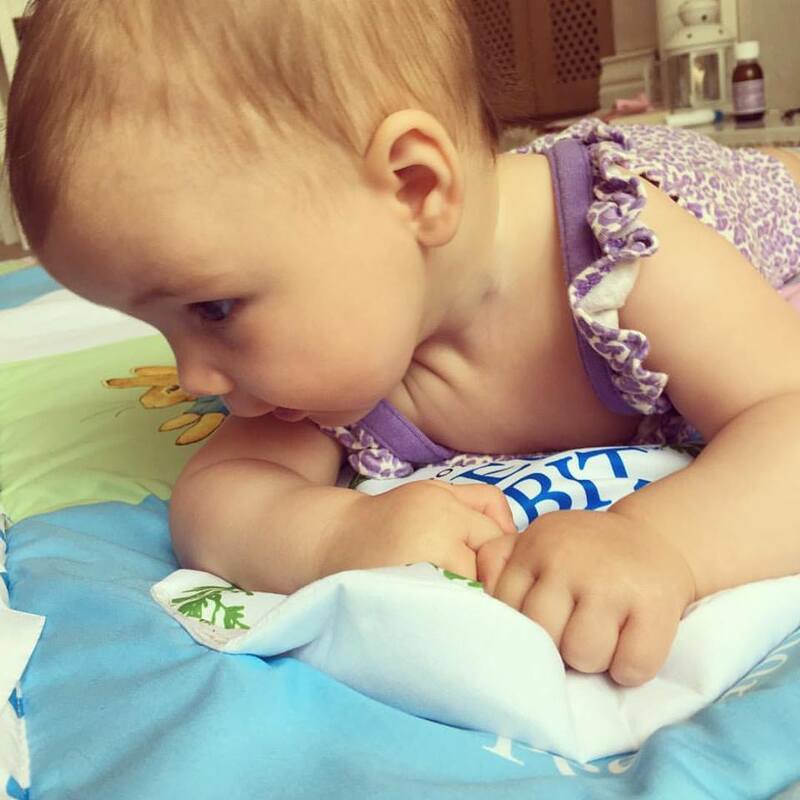 Tummy Time seems to be encouraged, and with it :- increasing head control becomes obvious, and probably appreciated by baby, parents, etc. Ava is growing up so fast. She is cute. She's beautiful, I'm due at the beginning of March and I'm so excited!